 No Stress Chess is a game that teaches chess.  Players play with action cards.  Can be flipped over to become a standard chess board. 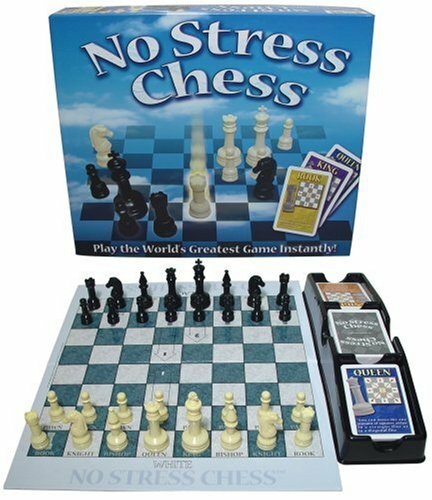 No Stress Chess is a great way to learn chess or to learn chess with "no stress". What's great about this game is that you can start playing a game of chess without actually knowing how to play. Players play chess using action cards. They draw these action cards and each card explains how each chess piece moves and the powers associated with it. As a result, players learn to play chess in the process. There are also cards that let you use your choice of either of the last two cards drawn, which allows for more flexibility in the game. The cards are really well made. Each card contains a picture and the name of the chess piece so that players can easily recognize it. It also explains how the movement of the chess piece, in which direction it can move and how far. Therefore, the game is based on luck as the cards determine how the chess pieces move. Once kids have become familiar with the rules of chess, usually after a few weeks playing with the cards, they can flip the board over and play standard chess (without the cards). A standard game of chess does not use luck but solely logic and concentration. The game includes invory and black chess pieces. It also includes rules for the game using the action cards and the standard chess game. Later on, as kids have learned how to play chess, they can move on to a proper wooden chess set. For more information on the benefits of chess, please visit our kids chess games page where you will also find information on games that teach how to play chess. We also recommend that you take a look at our page related to Sudoku. Sudoku is another game that can help kids develop logic, judgment and concentration.